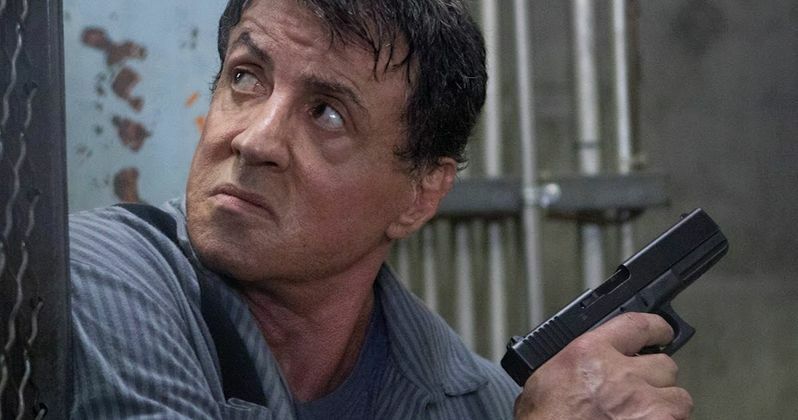 Back in October, Emmet/Furla/Oasis revealed that it had greenlit the sequel Escape Plan 2, with original Escape Plan star Sylvester Stallone returning to star, although there is no word yet whether or not Arnold Schwarzenegger will be back as well. Shooting got under way in Atlanta, Georgia this week, and earlier today, Sylvester Stallone sent out the first video from the set, revealing his bloodied face, along with his co-star Dave Bautista and new cast member Jesse Metcalfe. What's perhaps the most intriguing part of this video, though, is a mysterious robot, that Sylvester Stallone would only say figures into the ending of the movie. Sylvester Stallone shared this video on Instagram just a few hours ago, where he tried to see if he's taller than co-star Dave Bautista or not. This video also gave us our first look at Jesse Metcalfe, who just recently joined the cast of this action sequel. While this video doesn't show much of the set, the robot is certainly something fans should keep an eye out for as production continues, if Sylvester Stallone decides to share more videos from the set. Here's what the actor had to say about the production on his Instagram page, which reveals the new title Escape Plan 2 Hades, while also teasing the possibility of a third Escape Plan movie. "On location filming Escape Plan 2 Hades with Dave Bautista and Jesse Metcalfe. The scene was interesting challenge and turned out great ... the film it really has a lot of energy and action Very glad to be part of it. I got a feeling they may be wanting to do a third one pretty soon... Count me [email protected] #Lions gate #EscapePlan2." The cast of Escape Plan 2 also includes Jaime King as Abigail Ross, Curtis "50 Cent" Jackson, who returns as Hush from the first Escape Plan movie, and Pete Wentz, who was revealed on the set in one of several new set photos posted this week by director Steven C. Miller (Marauders, Arsenal). These photos also include a better look at Dave Bautista, who is reuniting with the filmmaker after their 2015 action-thriller Mauraders, along with a shot of the director discussing a shot with Sylvester Stallone. The director also shared a brief video from the first day of production on Monday, which teased a high-octane car chase scene. The original Escape Plan followed Sylvester Stallone's Ray Breslin, a security expert who is set up and sent to the world's most impenetrable prison. He teams up with Arnold Schwarzenegger's Rottmayer to break out and clear his name once and for all. Escape Plan wasn't a huge hit domestically, but its overseas take in China is a big reason this sequel is going forward, and is now an official U.S./China co-production. Escape Plan only earned $25.1 million domestically, but it earned an additional $112.1 million worldwide, $40.9 million of which came directly from China. This action sequel is being produced by Beijing-based Leomus Pictures and Emmett/Furla/Oasis, with Mark Canton also producing, under a $20 million budget. No official plot details have been released as of yet, but until then, take a look at the first videos and photos from Escape Plan 2 Hades, as production continues in Atlanta. Escape Plan 2 Is Happening with Stallone, But What About Schwarzenegger?